A Hawaiian native, poke is one of those delicate meals that tantalizes your taste buds serving proportions of carbs, proteins, and raw vegetables to nourish your day. Poke sits very well with health-conscious Vancouverites and has been dubbed sushi 2.0 by some. What makes good Vancouver poke? This begs the question, what is good poke? Here are some points we’ve considered in finding Vancouver’s BEST poke. Poke: evidently the poke has to be good. The fish importantly has to be fresh. The fish (be it salmon, tuna, or octopus) should be well marinated with soy sauce or the likes to be considered poke! The toppings: Now, generally poke is eaten by itself in Hawaii. However, we Vancouverites and much of the mainland appreciate the variety of health and flavorful toppings like cucumbers, avocados, seaweed, crab salad, or whatever your preference is! (Jalapeno?) Perhaps not quite as authentic but more nutritious and delicious; change is good right? Rice: The rice has to be well cooked, gently seasoned. Brown rice is always healthier and being able to get perfectly cooked brown rice is a bonus. Most good poke stores in Vancouver have this nailed! Being able to mix your rice and salad as the base is considerable too, reduce your carbs intake. Service: You want good service that’s quick to make you feel good. No one ever goes out to seek a bad experience (well, maybe if you’re like some Americans.) Generally speaking, fast-casual food and restaurants are as much about service as they are about food. Ocean-wise & eco-friendly poke: Well, because we’re Vancouverites, we care about our seafood and we care about our ocean. Having fish that is sustainable is much appreciated. Many poke restaurants in Vancouver will carry sustainable seafood and wild seafood (generally healthier than farmed seafood but farmed seafood can be more sustainable.) A few poke restaurants in Vancouver also seek to get the officiated certification. (Honestly however, so long as the food is sustainable pursuing a certification is just more costs and likely a marketing ploy.) Basically, it’s nice to know what you’re eating and your impact on the environment. What makes The Poke Guy poke so irresistible? Firstly, their location is conveniently nestled in downtown Vancouver (towards Gastown actually.) Secondly, they are the only Ocean-Wise certified poke restaurant in Vancouver; they care about our environment and ocean as much as you do as a Vancouverite. All this wouldn’t mean much if the poke, the fish wasn’t fresh, or if the flavors were mediocre; but the fish is fresh (usually) and the flavors are like a symphony in your mouth. It’s good poke and you can dress it as you like. There are a few gripes we have about The Poke Guy but bar none, it is the best poke in Vancouver. (My first experience with The Poke Guy was actually negative but went back and after trying a variety of poke restaurants in creating this list – it is truly the best where it comes to variety, poke, and flavors.) It is the only poke restaurants you can get pork cracklings on top of your poke as a garnish with the ever popular furikake. What to expect at The Poke Guy: Non-pretentious poke, lots of toppings, fresh fish. With salmon selection, they only serve wild sockeye salmon with their poke; there is no farmed Atlantic salmon available. 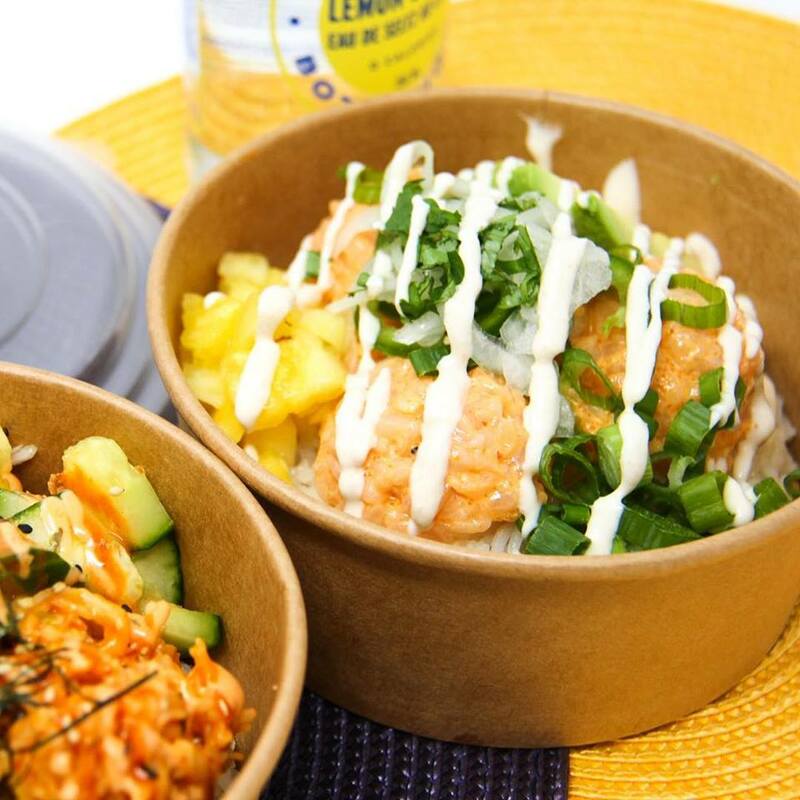 They serve their poke to-go in a cool compostable cardboard-like rectangle container, or you could have in a ceramic bowl in store. The Poke Guy prices: $10.95 for the big bowl (really big bowl) but poke is extra. (quite a different approach from the rest of the Vancouver poke stores that include poke in their prices to be transparent.) It ranges from $2-$2.50 per scoop of poke which are quite generous portions. They generally recommended five scoops of poke for the big bowl. Unlimited toppings for the big bowl and The Poke Guy has a wide availability of toppings. Fresh poke at The Poke Guy. Enjoy your Vancouver poke in a ceramic bowl in their poke restaurant or take out Vancouver poke in a compost-able take out container. The fish is reasonably fresh unless you come towards to end of the day it seems and they allow a choice of two bases with brown rice, white rice, and vegetable mix available. It’s good Hawaiian poke with a Westcoast spin. They even have bacon aioli. Service and quality varies on occasion however. If you get a newer staff versus a more experienced and friendly staff. Westcoast Poke prices: $10 for snack size (which is actually quite sizable – about 2 scoops/oz of protein. ), $12.50 for medium, $15 for big bowl. The poke toppings and garnishes are included, even avocado and mangos, but limited – seven mix-ins, five toppings, two premium toppings, and seven finishes. Bone broth cup for $5. They also do order online and delivery. This is the Westcoast Classic at Westcoast Poke. Delicious mix of scallops, bacon aoili, and cucumbers among others. Good poke! Pacific Poke is a staple for many Vancouverites. One of the later poke restaurants to hit Vancouver, Pacific Poke is going strong with two locations currently (the first at Chinatown Vancouver, and the second at UBC Vancouver) …for good reason. First opened in December 2016, they have amassed a loyal following of poke fanatics. They serve fresh fish with their poke; their poke toppings are quality stuff; their sauces are home-made; their slaws and salads to top your poke is extraordinary. Their portions are slightly smaller than other poke restaurants in Vancouver you may be accustomed to (like Westcoast Poke or The Poke Guy) and their prices are what you would expect for poke. 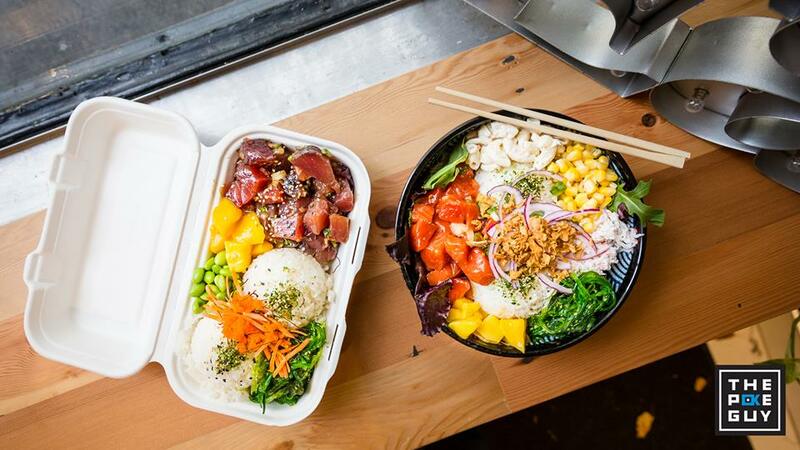 Pacific Poke Prices: Regular poke with 2 proteins and 3 toppings for $12. Large with 3 proteins and 4 toppings for $14. Chef-inspired poke at Pacific Poke for $12 – The Veggie, $13 – The Cali, $14 – The Keefer, $14- The Main. Main and Keefer are the most popular. Coco Panda drink $4.50, Yuzu Lemon Tea $3. If you’re bold enough, poke panini for $9.80 is available ($5.80 half). Pacific Poke features variety of chef specials “The Main” “The Keefer” “The Cali” or build your own bowl. Good Vancouver poke. Poke done right. Unique poke variations. Pokkerito offers five signature poke. The most popular and favourite of customers is the Diamond Head which contains spicy tuna, green onion, sweet onion, cucumber, lettuce, spicy seaweed salad, crabmeat, jalapeno, ginger, masago, crispy onion, furkake, chili flake, sweet chili sauce. Another popular choice is the North Shore which contains their signature umami sauce. Of course, they also have the classic build-your-own poke options. Much like WestCoast Poke, you can even order your poke through Foodora. Their original location was at 558 Dunsmuir street just across from 7-11 and adjacent to Peaceful Restaurant however a newer location is at 991 Hornby Street besides Tim Hortons. It is not absolutely fantastic poke but it is acceptable, a notch up from Poke Time if you like comparisons. What is a draw-back with Pokkerito is they provide less topping options and less toppings. What is good about Pokkerito is the consistency and the unique sauces. If you’re looking for a poke experience then you would have to go to The Poke Guy or WestCoast Poke where they really emphasize on the Hawaiian poke experience. Pokkerito is just another fast-casual, health food, poke restaurant that’s convenient located in downtown Vancouver capitalizing on the health food craze or sushi 2.0. They got two locations for added convenience. What to expect at Pokkerito: Fast service, reasonably fresh fish, your typical good poke with convenience. They have poke burrito however I can’t imagine that’d be enjoyable. They seem to really emphasize on capitalizing trends/craze such as umami + poke + burrito. A sushi chef taking an opportunity on the trending poke craze. Pokkerito Prices: Signature pokes at Pokkerito are $11.95 for a regular size with a $3 up-charge to make it large. Prices are the same for build-your-own poke bowls. Their regular BOYB allows for two protein choices with five mix-ins, one sauce, two sides such as seaweed salad or crab meat, and five toppings. Their large BOYB poke spots the same options with three protein choices. A “poke burrito” can be chosen for the same price if you’re looking for a bite to-go. We’ll likely be replacing this with The Pokeman after a few months when Pokeman has been tested for consistency. The Poke Shop is owned by Brian Leung who started with a teppanyaki store in Aberdeen centre. This was his next venture which means they are also trying to capitalize on the poke craze in Vancouver. Is it good poke? Well, they try to keep the ingredients fresh in metal containers instead of the usual plastic containers. They have very interesting themed interior. They have a reasonably wide variety of toppings and they even serve ramen. What to expect at The Poke Shop: Great services. Ramen. Higher prices. Good poke. They have zucchini noodles (zoodles) available for your poke. Lots and lots of toppings available. Different take on poke. The Poke Shop Prices: $14.50 for regular poke bowl with two scoops of protein, 27 toppings to choose from, and seven sauces you can choose. $17.95 for large with three scoops of protein. Interesting drinks available such as Roasted Macadamia Milk Tea or Matcha Green Tea with Honey for $4.50, or $3 if you get poke. We’ve tried many poke Vancouver options before compelling this list. While we have chosen to recommend only the top 5 poke restaurants in Vancouver, there are still many other poke option that hits the mark….they just fell a little bellow these other great poke stores in such a competitive environment! These Vancouver poke restaurants will still wow your taste buds and keep you coming back for more. These poke stores are still worth trying out if you happen to be around the area. Poke Time – Ah, the brand synonymous with Vancouver poke. One of the first poke restaurants in Vancouver. 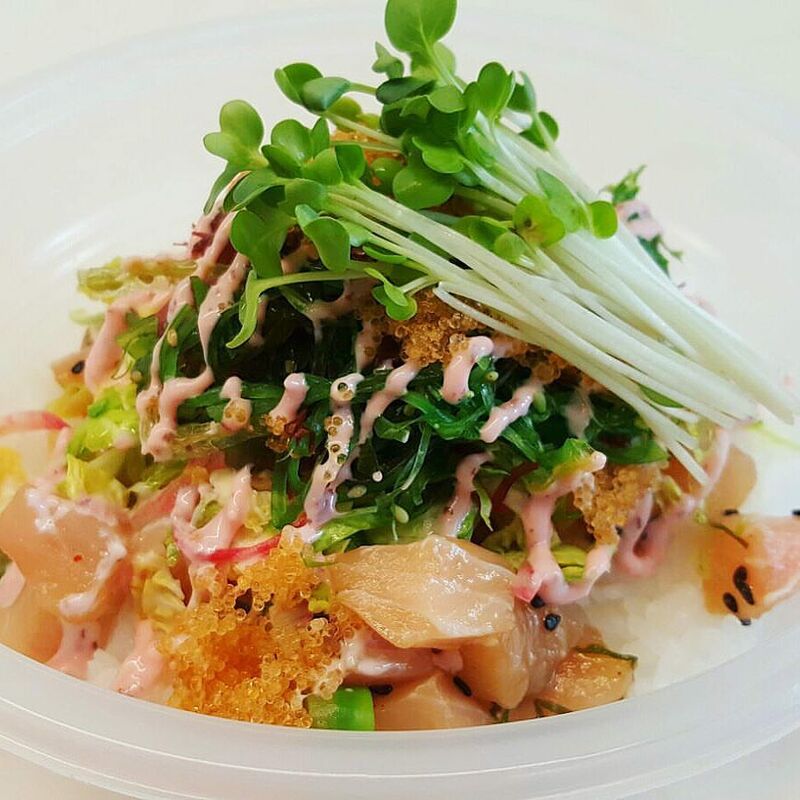 They have three poke locations all centrally located in downtown Vancouver. They don’t have quite a variety as the best 5 poke in Vancouver, however. Also, in our opinion, offering morning corn flakes as a poke topping seems to make the poke seem cheapened – maybe change that to pork cracklings for crunch or home-made croutons to elevate it. Carp – The way poke should be. There is no build-your-own poke bowls here but you get the chef’s special. Smaller portions but a good price. Excellent, excellent poke. Just not your traditional poke restaurant – they sell sushi but their poke is available as a meal or a snack. There aren’t any fancy vegetable toppings, you get it as it was designed and prepared! Shishinori – There are three poke restaurants around the Broadway-Cityhall Canada Line station alone! One great (Westcoast poke), one good (Shishinori), and one to avoid (Poke Station). Shishinori serves Hawaiian fushion Asian food and they also have a large variety of pre-designed poke menu that are pretty good in their own. Daddy’s Kitchen – A newly opened poke restaurant in Vancouver that serves everything from Thai milk tea to a variety of sushi. The poke are reasonably priced with an option to build your own poke bowl as many other poke restaurants; the caveat is freshness may vary on when you visit. Conveniently located on “the Drive” – for non-Vancouverites, it refers to the neighborhood on Commercial Drive – the locality also has many Italian food (and pizza restaurants). The Pokeman – Nestled between in the Dunbar and Sasamat neighborhood, this Vancouver poke restaurant is making quite an impression among poke enthusiasts. This poke restaurant in Vancouver just might find itself on the top 5 in time. The Pokeman truly source local; they even use fresh farmer’s market corn by season. They offer Sockeye salmon, local tuna, and chopped tuna toro for no up charge which is incredible value and evidently emphasize their focus on quality. The Pokeman just opened in August of 2017; we hope the quality keeps up! Opened by three partners who are local Vancouverites with a love for poke and Japanese cuisine. What differentiates The Pokeman from other poke restaurant is the high quality, fresh ingredients and their 8 grain rice for the base, along with super crunch mix to top off their poke. Prices are very reasonable and on par with other poke restaurants in Vancouver with higher quality factored in. Hoke Poke – A recent addition to the poke scene located on 4th Avenue in Kitsilano that replaced a former ice cream store (guess it was too much competition when Rain and Shine came in) Not to be confused with the Poke Guy which is our pick for the #1 best poke in Vancouver. As with most poke restaurants in Vancouver, expect fresh fish and delicious mix of toppings available. They use decompose-able bowls and poke lovers love their poke. Poke Corner – No kidding, the WORSE poke I’ve had in Vancouver. The fish wasn’t fresh – it was warm, they didn’t probably keep it chilled. The portions were stingy; literally, the person numbered the strains of carrot she was putting. The service was dismal; you’ll get better service anywhere else. The person who was presumably the owner (older individual in her 40s) was handling the order and she was the worse person I’ve met; did I say worse enough times? Had to repeat my order several times. You’re limited to 7 toppings which includes if you choose masago and nori. (Nori is usually an included toppings referred to as finishes at other poke restaurants.) The younger girl behind evidently felt sorry and embarrass about the unbelievable experience customers got. Prices are the same as Westcoast Poke but quality and portions were largely bellow par. They literally counted the number of carrot strains (appears they use big China carrots – it was tough carrots and dry – and julienne them.) It’s no coincidence they have plentiful negative reviews. Please do yourself a favor and avoid Poke Corner if you’re looking for good or edible poke. Poke Station – Many customers have complained about the freshness of the fish and the customer service experience at Poke Station. When it comes to poke or any raw fish, you don’t want to take your chances if food safety is not adhered to diligently. Consistently, Poke Station patrons have mentioned of mushy fish and questionable cleanliness. They say, if you want to know how clean a kitchen is, look at their washroom – it appears you don’t need to look much farther than their front of house here. Skip yourself the disappointment and head over to WestCoast Poke just three minutes from Poke Station. Unfortunately, these poke restaurants are the main ones conveniently located on the popular Broadway intersections. Don’t worry, if you’re craving poke while on Broadway street, there’s a great poke restaurant just minutes from Broadway-Cambie Canada Line station – Westcoast Poke! They came very close to #1. You should most certainly try poke at Westcoast Poke if you haven’t. How many Poke Restaurants does Vancouver have? You may be curious, how many poke spots does Vancouver currently have? In making this article about the best poke in Vancouver, we’ve scoured to find every poke in Vancouver, sort out the best, and then confirm it with a taste-test and a deeper look. In the process, we’ve sorted through 15 poke restaurants – these are eateries in Vancouver that only sell or specialize in poke. There are also a variety of other restaurants and eateries that offer poke on their menu but are far from being specialized in poke. This even includes restaurants like Earls (who offer Ahi Tuna poke on their menu) and casual eateries like Hime Sushi (that offer poke salad on their menu) and Urban Sushi (offering poke bowls and “sushi burrito”) even completely random cafes like Island Cafe now offer poke! There are a total of 20 poke stores in Vancouver, 10 of which is downtown. Some brands have several locations within the city of Vancouver – Poke Time has 3, Pacific Poke has 2 …which one is a franchise ran entirely by UBC and very different in quality+experience+service, Pokerrito has 2, Westcoast Poke is planning to open their 2nd which will be in Richmond…not Vancouver. However, there are many other restaurants and eateries ranging from bars, social eateries, to sushi restaurants who serve poke as well. Poke is certainly the new trend in Vancouver. You’ve got even restaurants like Craft Beer Market and Bao Down Gastropub cashing in on the poke craze with their variations of poke (and fusion dishes) on their menu. Never knew poke could be pub food but I suppose it is now! What Makes For Good Ramen?